Music connects to souls instantly, we can easily get carried by the beats and melodies. It helps to change the perspective as well as can sway you away from reality for a while. These days, there are many formats using which we can create and transport music files through devices. MP3 (.mp3) is commonly used as the audio format since it is supported by most of the devices and players. In spite of that, there are some flaws which is why MP3 isn’t the perfect audio format. It removes some unneeded components from audio files and also reduces the accuracy of the sound in order to compress the file size. Hence, to listen to better music, MP3 can be converted to MIDI. So first let’s try and understand what exactly is MIDI. MIDI stands for Musical Instrument Digital Interface. MIDI is the set of instructions that work on data. It is commonly used in playing keyboard instruments. MIDI allows different pieces of digital music equipment to communicate to one another. It is not exactly file format but a note-based format. It preserves full music strength and duration of the notes actually being played. Why MIDI is better than MP3? MIDI is comparatively small, thus audio files with MIDI loops are quick and easy for playing along with online uploading. If MP3 is compared with MIDI, MIDI files have better quality and therefore sound better than MP3. Besides, it is more adaptable to a wide range of software application as well as with different devices. MIDI is compressed and can be easily modified with respect to all aspects like key, tempo, melody, timbre, etc. If you want to convert MP3 to MIDI online, we will guide you find the correct ways to convert your files. It is easy to convert MP3 to MIDI when you don’t want to include the third-party desktop-based software. There are many applications available for this online conversion like AVS Audio Converter, Intelliscore, WIDI Recognition System, etc but most commonly used and tried and tested application are Bear File Converter and Conversion Cat. Bear File Converter is an absolutely free online audio converter. It helps to convert WAV, OGG, WMA, MP3 and more stream audio to MIDI file which moreover the converted MIDI file is relatively small. But remember that the audio file to be converted has to be 50MB or smaller in size. It converts WAV, MP3, OGG, AAC and WMA files to MIDI format. Step 1: Go to Bear File Converter’s MIDI Converter page. Step 2: Click on the Upload option and upload the audio file you want to convert. Or else you can drag the audio file to the interface. You can see the status of upload from the progress bar, it might be slow sometimes mainly depending on the file size and network connection. Step 3: Once the file is uploaded, click on the Convert option. Step 4: When the application finishes the conversion, you can download the converted file to your computer. It will easily open in your default audio player like Windows Media Player. Conversion Cat is another excellent application which is user-friendly, as well as its interface, is clean and more understandable. Similar to Bear File Converter, the audio files to be uploaded, can be as large as 50 MB. If you want to convert files larger than 50 MB, you can register and log into Convert Cat. In Conversion Cat, you have two options, one is “Convert Files” option and the other is “URL Converter” option. You can choose whichever you want. Step 1: Go to Conversion Cat’s MIDI Converter page. Step 2: Click on Choose File option and upload the file audio you want to convert. 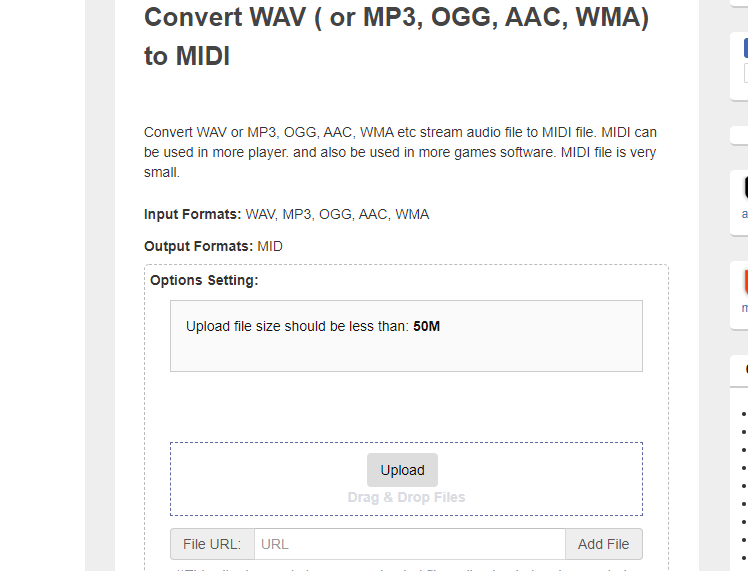 Step 4: Then, click on Convert option to convert your uploaded file into MIDI. convert Cat will send you an email which will have the download link. Thus, on clicking on that link you can download the file and play it in your default audio player like Windows Media Player. If you don’t find the email in Inbox folder, check in the Spam folder. Is there any other software which can convert MP3 to MIDI? Apart from Bear File Converter and Conversion Cat, there are other softwares, too, which are very user-friendly. This application is understandable and easy to use. Also, it is not only limited to MIDI but audio files can also be converted into many different formats. It supports many different file types. Also, audio files can be easily extracted sound from the files and convert it in batches. WIDI is free, user-friendly and produces an excellent result. But you need to have the extensive background knowledge about music and its technical sections. What makes this Intelliscore more special because it has an improved visual pitch indicator that helps you to tune instruments which are backed up with free technical support. Not only it can convert any audio file type to MIDI but also but can compose MIDI by singing or playing any musical instrument. 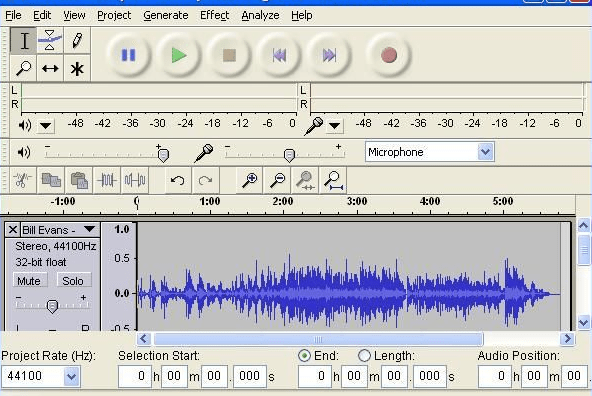 This Software has always been number one choice for the audio file conversion. Here is the complete guide to know how to convert MP3 to MIDI with the help of Audacity. Also, remember that you may need to download a lame_enc.dll file. Step 1: Once you download and install Audacity, open it on your computer. Click on the File an got to Open. Step 2: Now add the MP3 file you wish to convert into MIDI or you can also drag the MP3 file into the Audacity interface. Step 3: Now click on the Play option to play the MP3 file you have selected. Step 4: Click on File option, then Export Audio, the Export Audio box will appear on your screen. Then from Save as type tab, select Other uncompressed files. You can now select and set format options. Pick SDS (Midi Sample Dump Standard) from Header tab. And then encoding according to your need. Click Save button. Step 5: Then an Edit Metadata tab will pop on your screen. You can either edit or modify the MIDI audio info here. Last but not the least, click OK to convert MP3 to MIDI. Apart from MIDI conversion, you can also utilize Audacity to convert M4A to MP3. This application mainly is designed for recording the music. It can recognize artificially produced music and convert it into MIDI. Moreover, if your audio file has various musical instruments, then Amazing MIDI can detect and analyze every single note of each instrument. This application has a special feature that it not only converts MP3 to MIDI but also it displays the saved audio files as sheet music on your computer thus, you can view the notes as they play. Also, you can add notes or change the pitch as you want. Besides you can share your music with other musicians in XML format using Notation Player. Moreover, you can also create your own music via Notation Player. Zamzar works similar to Conversion Cat. It is completely free and you can convert any URL or audio file into MIDI using this application. It available on all the platforms. This software is for Mac users. It converts videos and audios to plenty of different formats. It is one of the user’s favorites before it can convert your audio file format in no time. Also, we are providing a short guide about how you can convert MP3 to other formats. VideoSolo Free Video Converter is an efficient and reliable video and audio converter. Though here you cannot convert MP3 into MIDI, it can convert a file to many other formats. For instance, you can convert MP3 to M4R for making iPhone ringtone. What’s more, after converting MP3 files to other formats such as AAC, AC3, AIFF, AMR, M4A, ALAC, etc, you are able to play your songs. The above-suggested tools are able to convert MP3 to MIDI with efficiency and fast speed. After you convert MP3 audios to MIDI files, you can modify them easily which you cannot do with MP3 files. Also, all the converters mentioned above are also able to convert other audio formats other than MP3 to many different formats. You can explore what the converters have to provide and utilize most of them.